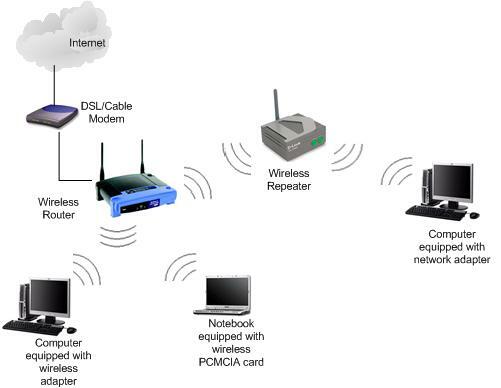 What is wireless repeater? It's a device usually used to extend wireless coverage in wireless network by repeating the wireless signal generated by wireless router/access point. Some better repeaters also able to improve wireless transmission rate. This device is also referred as wireless range extender, booster or expander by some vendors. Most of the time the repeater would give you the best performance if the one you purchased is from the vendor same as your wireless router/access point. The repeater is best used to provide wider wireless coverage to reach those distant, hard-to-reach areas at your home where cabling is impractical. The wireless standard supported are usually 802.11b/g/n or 802.11b/g/n/ac. 802.11b and 802.11g use the 2.4 GHz band; 802.11n can use either the 2.4 GHz or the 5 GHz band; 802.11ac uses only the 5 GHz band. Therefore you should select the one that can work with the wireless devices you have in your wireless network. Sometimes this device is not only work as a repeater, but also can act as wireless access point. Having both features would add the flexibility of the usage. 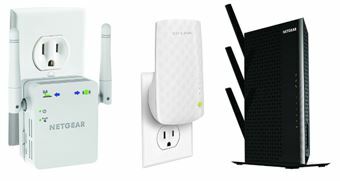 Diamond Multimedia Wireless Range Extender WR300NSI is one of the example built with both features. In terms on how to locate the repeater, you should locate it at the edge of your wireless network to better expand the wireless range. The configuration of the repeater is pretty simple. Usually you only need to configure it with basic network setting, wireless name, SSID and wireless security features, connect it to other wireless router/access point, then you are considered done.. Furthermore, the simple setup wizard that provided by vendors is easy to use to set it up. So, no more wireless coverage problem in you wireless network by using wireless repeater from now on. NETGEAR AC1200 EX6200 WiFi Range Extender (Up to 1.2Gbps / 802.11ac) - Maximize the power of your network and make sure you have coverage in every corner of your home with the AC1200 Dual Band WiFi Range Extender. Hawking HD45X Wireless Range Extender (Up to 450Mbps / 802.11bgn) - Hi-Gain™ Dual-Band Wireless-N Range Extender repeats wireless signals from any access point or router with 2.4GHz or 5.0GHz signal from an existing network. TP-Link AC750 Dual Band Wi-Fi Range Extender (RE200) (Dual band speeds up to 750Mbps, 802.11b/g/n/ac) - This TP-Link AC750 Dual Band Wi-Fi Range Extender (RE200) expands your existing WiFi coverage with next generation 11AC WiFi technology. It works with any standard WiFi router and creates stronger dual band connections in hard-to-reach areas, allowing you to enjoy seamless wireless coverage throughout your home or office. NETGEAR N300 Wall Plug Version Wi-Fi Range Extender (WN3000RP) (Up to 300Mbps, 802.11b/g/n) - The N300 WiFi Range Extender boosts your existing WiFi network to places out of reach of your existing WiFi. Plug it into an electrical outlet and give your WiFi a boost. External antennas give you the extra range to put your over the top. Securifi Almond - World's 1st Touch Screen Wireless N Router + Range Extender (Booster) (Up to 300Mbps, 802.11b/g/n) - Almond is a revolutionary device that brings touch to Wireless Routers for the first time in history. For the first time users can setup & maintain their router easily from its highly intuitive touch screen. You can avoid the cumbersome PC/Mac based setup that is common with other routers. Its dual purpose -- You can use it either as a Wireless Router or a Range Extender. Amped Wireless High Power Wireless-N 600mW Smart Repeater and Range Extender (SR10000) (Up to 300Mbps, 802.11b/g/n) - The High Power Wireless-N 600mW Smart Repeater expands the range of any 802.11b/g/n wireless network by repeating the signal from a wireless router and redistributing it in a new, "extended" location. The SR10000 is equipped with advanced dual 600mW amplifiers and 5dBi detachable high gain antennas to extend Wi-Fi coverage by a staggering 10,000 sq ft. Please note some vendors also come up the wireless extender with outlet pass-through feature so that still you can use that power outlet for other electronic devices after plugging in the wireless extender. The examples of these kind of extender are Linksys RE6700 AC1200 Wireless Extender with AC Pass Thru and TP-Link TL-WPA8630P AC1200 Wi-Fi Range Extender AV1200 with Outlet Pass-Through .